Powered only by solar energy. April 26, 2016: Following is an article I wrote in 2013 about the solar airplane and the Solar Impulse. The Solar Impulse 2 is on its around-the-world flight and just finished its 10th leg of its tour, landing in California. It started in Abu Dhubi, in the United Arab Emirates, where it will also end, taking 2 years to complete. 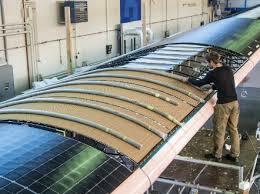 It will travel a distance of 35,000 miles on solar only, with cruising speeds between 28mph-56mph. June 21, 2013—–Photovoltaic (PV) technology, or the solar cell, is a power supply that produces electricity from the sun’s rays. In 1954, Bell Telephone Labs developed the first Photovoltaic Cell capable of powering everyday electrical equipment, but with only 4% efficiency. The solar cell has quickly achieved greater efficiency over the decades, as people seek free energy from the sun and express their concern about CO2 and global warming. When a solar cell is exposed to light, it can generate an electrical current without being attached to a voltage source. Photovoltaic–the term “photo” is derived from the greek word meaning “light” and “Volt” is from Alessandro Volta, inventor of first battery in 1800. Therefore, photovoltaic cells produce energy from light, which is a sustainable energy source. If something is “sustainable” it has been “developed to meet the needs of the present without compromising the ability of future generations to meet their own needs,” Sustainability also meets the needs of our planet, maintaining a healthy environment in which life can survive and flourish. The first solar airplane to fly was an unmanned craft , Project Sunrise, in 1974 by Roland Boucher, an engineer for Hughes Aircraft. 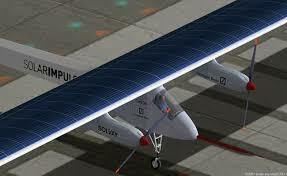 Boucher developed an aircraft powered only by solar panels on its wings. The Sunrise had a total weight of 22 lbs., could soar to a height of 8,000 ft., and made 28 flights before being destroyed in turbulant weather. Boucher’s invention had enough success to “demonstrate the feasibility of solar powered flight at extreme altitudes,” and opened the door for solar innovators to take to the sky! Jump ahead to 2013, a solar airplane that can fly forever without landing, developed by a company called Solar Impulse which was founded by Bertrand Piccard and Andre Borschberg. Piccard came up with the idea of flying a solar aircraft after circling the earth in a hot air balloon. He stated, “After using almost three tons of fuel during my balloon trip, I knew I wanted to try to create a cleaner way of traveling. The balloon trip was almost a failure due to the dependency on fuel. On that day, I made a promise that the next time I would fly around the world, it would be with no fuel at all. “Our company, Solar Impulse, has a goal—to prove that progress is possible using clean forms of energy.” The Solar Impulse aircraft is a one man airplane, can fly night or day, uses 12,000 solar cells mounted on its wings and stores the sun’s power in batteries–no fuel used! It flies approximately 45mph, uses the latest technology in advanced batteries to store the power of the sun and enables the aircraft to fly round-the-clock. It has the wingspan equal to a 747 jet, but weighs no more than a car. Piccard and Borschberg piloted the Solar Impulse aircraft, alternatively, beginning May 3, 2013, making city-to-city jaunts starting in San Francisco and landing in Washington D.C. 45 days later. 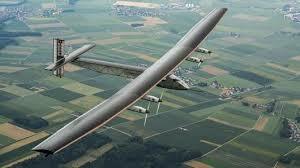 This transcontinental flight has prepared the way for Solar Impulse’s second generation of aircraft which will fly around the world in 2015. The improved version will have a larger cockpit and everything necessary for the pilot to survive in the air for 5 or 6 days. Categories: Building Green, Climate Change, Renewable Resources, Solar, Sustainable Education | Tags: Fossil fuel, Renewable energy, Solar power, Sustainable energy, The Solar Airplane | Permalink.